There are plenty of cases that will protect your iPhone from just about anything, but how many will protect you? 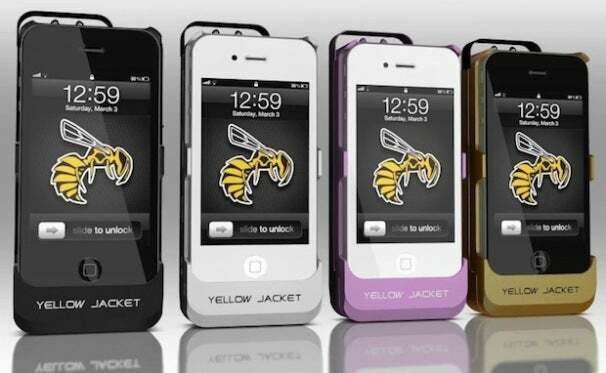 The Yellow Jacket is a case for the iPhone 4 and 4S that doubles as a 650,000-volt stun gun to ward off the dangers of society. They are currently running a campaign on indiegogo.com for funding and have a myriad of options for the early investors; they normally retail for $125, but you can get the Early Bird special for $85, your choice of color (currently black, white, or pink). The idea behind the product is to put a defense tool on something that you already have on you at all times. There are plenty of people with pepper spray or a Taser in a purse or on keys or sitting useless in a drawer at home, but that does no good when a surprise attack happens. I'd say they made a pretty safe assumption that you will have your phone handy almost all of the time. But how smart is it to place a 650,000-volt weapon next to your face when having a quick chat? Luckily, the case has a couple of safety features to prevent accidental misfires. A rotating electrode-cap blocks off the dangerous part until needed and a safety switch disables the device. The team claims that in less than a second, both of these features can be disabled and ready to take on an assailant. Will it still fit in your pocket? The unit is a total of 1 inch thick and adds a total of 3/8 of an inch to the height of the device. The case itself weighs 4 ounces, tuis doubling the weight of the phone to 8 ounces; it's a little bulky, but not too bad for a concealed defensive weapon. Finally, the Yellow Jacket has another effective use for your phone that almost outshines the feature function. The device is capable of extending the phones battery life up to 20 additional hours. A switch on the bottom switches the power from stun-gun standby to actively charging the phone. But beware of using too much of the battery or the device will become useless, and watching that extra cat video is just not worth your safety. I see a lot of good coming from a device like this. If there was a chance anyone could have a stun-gun on their phone, it may ward off the next purse-snatcher. However, I do see a lot of mishaps and drunken bar tricks happening as well because tazing yourself just wasn't as funny as you thought it would be. And you'll want to check with your local law enforcement agency to see if there are any restrictions on carrying something like this. There are plans to develop and produce cases for the iPhone 5, HTC Evo and Samsung Galaxy phones in the future.